Hi everyone; here is the Introduction I Received while attending the 107th VFW National Convention in Reno, Nevada on the 27th of August 2006. 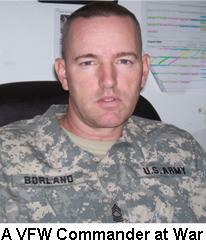 "MSG Tim Borland is a 27 year Army veteran still serving on active duty. 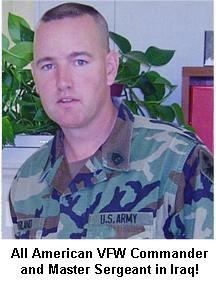 He has been deployed to Iraq since December 2005 with a Military Intelligence Unit of the 101st Airborne Division. Following this convention, he will return to Iraq to complete his year-long deployment. His permanent assignment is with Company B, 304th Military Intelligence Battalion, 111th Military Intelligence Brigade, at Fort Huachuca, Arizona, where he serves as the Joint Intelligence Combating Training Course NCOIC. Included among his many decorations and awards are three Meritorious Service Medals; four Army Commendation Medals; eight Army Achievement Medals; the Korea Defense Service Medal; and Global War on Terrorism Service Medal. 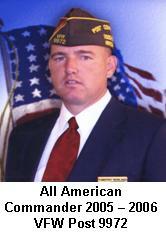 He has been a VFW member since 1992 and served in many leadership positions. He just finished his year as VFW Post 9972 Commander and is receiving All American honors at this convention. He presently serves as Arizona's District 7 Senior vice Commander. VFW National Director Mike Wysong requested the Army to let lose of Tim for a week and give this committee a "Boots on the Ground" perspective of what's going on in Iraq and how important the VFW's support for the troops and their mission is to the men and women who serve in harms way. He and his wife Jennifer has six children ages 10 to 14. Please welcome All American Commander, Master Sergeant Tim Borland." All American VFW Commander and Master Sergeant in Iraq! Good morning comrades, ladies, brothers and distinguished guests, it’s an honor to be in front of so many great Americans like yourselves. 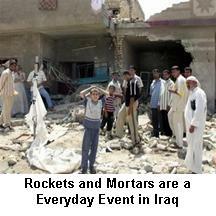 This is my “Boots on Ground” Perspective of what’s going on in Iraq”. I will emphasize how important the Veteran’s of Foreign Wars (VFW)’s support for the troops and their mission are, and what it means to the men and women who serve in harms way for this great Nation. But, first, I will discuss some problems Iraq is having, the enemy who wears no uniform and if the Iraqi people even want us to remain in Iraq or not. I will also tell you two stories that I would like to share with you today; one is about a patrol that protects our base and the other about an Army Chaplain who would love to serve the Veterans of Foreign Wars (VFW). Lastly, I will close with what the VFW has done and can continue to do to support our troops while deployed in war. When the Iraq war began in 2003, the American plan was clear; we would eliminate Saddam Hussein and his weapons of mass destruction and punish him for refusing to comply with United Nations (UN) Security Council resolutions and for supporting Al Qaeda. The U.S. is trying to help Iraq become a democratic country with a justified government and fair laws, but the Iraqi people didn’t do what we expected them to do, and they did not follow our plan; not even close. Ever since the bombings of a Shiite Mosque in Samarra last February, Sectarian violence has almost destroyed the country entirely. The enemy who wears no uniform is very hard to distinguish between and the one problem is you don’t know who the enemy is because they don’t have a uniform that stands out as a “danger sign or warning” and they all look the same. You would expect most of our problems would be from Sunni insurgents since Saddam Hussein himself was Sunni; however, this isn’t the case in Iraq. Both Shiite and Sunni insurgents are attacking each other, which make the enemy very hard to know who is who; even the Iraqi citizens don’t know. Neither side are focused on U.S. Soldiers but Americans do sometimes get caught in the cross fire and unfortunately sometimes hit Improvised Explosive Devices (IEDs) that are laid in streets and local markets within populated areas. Today, Iraq is fast becoming ungovernable; militias from Sunni and Shiite communities are trying to turn what had long been a Secular, integrated and modernizing society into an ethnic and Islamist paradise. 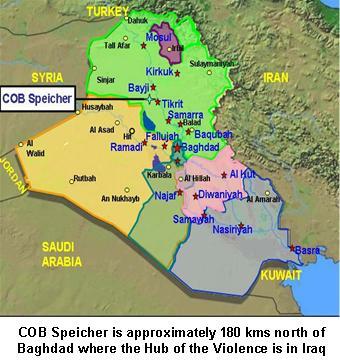 There is little point in debating whether Iraq is in civil war yet. Random killings, ethnic cleansing by all sides and rampant corruption are pushing society in that direction. Armed militias and vicious gangs kill for profit and pleasure, and occasionally for religion or ethnicity. The real fight is all about power, money and control; Iraqis, not Americans, are the primary targets; the ratio is at least 60:1 per day. The uniform the enemy wears in Iraq can be anything from an Iraqi Police uniform, Iraqi Army uniforms or a local national (LN) who works on a U.S. installation. There’s no telling where the enemy will come from or when they will strike; we always must be prepared and we must always be ready to expect the unexpected, because there is no template or enemy doctrine with insurgency. We can not deny that we have a responsibility to finish what we started three years ago when we invaded Baghdad, but does everyone in Iraq want our help? Let’s give the U.S. forces that were moved into Baghdad a chance to clean it up first. President Bush extended a couple of units for four months; let’s see what they can do; so far, good news is coming out of it; insurgents and cell leaders are being detained daily. There are still many Iraqi women, children and displaced families (approximately 250,000 people) who desperately need our help; surely, we can maintain our security presence, prepare military and police forces to take over security duties, provide training and protection, and help fragile political institutions take root. But, will it be enough for us to withdrawal and will it keep our troops from harms way? Every answer isn’t simple and every decision isn’t easy; it’s up to our government and our leaders of this great nation to decide. Staying the course in Iraq will not solve all of Iraq's problems, and it will, sadly, mean more casualties in the long run, but withdrawal will not end the violence either or ensure that Iraqis live happily ever after in their enclaves or end anti-American terrorism; the United States will still be targeted as will pro-American friends. Continued surveillance, reconnaissance and foot patrols keep are young Soldiers alive. That leads me into the first of two stories about a patrol who protects our base. There were two heroes in this patrol; both SSG Byers and SGT Manning took charge when Soldiers needed them most. I wanted to let everyone know that heroes are every where in Iraq. Only two days after the AT mine nearly took this patrol’s life, they were back at it again, patrolling our AO to protect the lives of over 10,000 Soldiers, civilians and contractors on COB Speicher. Here is their Story! On 29 July this year, SSG Byers patrol came upon a situation that every patrol and/or Soldier fears the most; an IED. He was in the process of checking some new equipment out when he remembers telling his driver to slow down because he noticed that they were coming up to an area that didn’t look right. A good patrol will always be familiar with their surroundings and should never proceed on unless absolutely sure the area is clear. He remembers checking his Blue Force Tracker (BFT), which is a device to keep track of other friendly forces in the area and to keep in on scope with the Base Defense Operating Cell (BDOC) where the Intelligence and Operations of COB Speicher is ran. This device normally sits approximately a foot and a half from him but in a moments notice, all he remembers is that it was now about two inches from his face. He had no idea that he just hit an Anti Tank (AT) mine and really can’t recall much before or after the hit. SSG Byers does remember looking at his driver to see if everything was okay and when he did, his driver’s face was covered with black soot from the engine’s oil. He remembers hearing his driver and gunner yelling to see if everyone was alright and all he cared about was if his Soldiers were okay. The blast from the mine shocked him enough that he couldn’t answer the calls from his Soldiers. Still in shock from the blast he managed to get on the radio to call for support and medical assistance for his Soldiers. 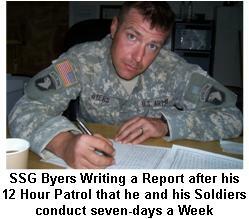 SSG Byers remembers calling the BDOC but doesn’t remember what he said until a day later when he was told that he did what was right. He told his gunner if there was any one out there that had a weapon or detonation device that he had permission to engage. The Rules of Engagement (ROE) put the patrol in immediate danger so they had the right to protect themselves; luckily for them and the enemy, no one was there. SSG Byers remembers his gunner yelling at him that he didn’t have his 240B, which is a weapon similar to an M60 Machine Gun. The AT Mine was so powerful that it blew the roof off their vehicle and his gunners’ weapon ended up sticking out of the radiator. At this time SSG Byers was still inside his vehicle when he could remember hearing one of his junior NCOs yelling from outside of the truck for him to get out; his junior NCO, SGT Manning thought SSG Byers was dead. Because of SSG Byers dazed condition, SGT Manning took control of the situation and had all the Soldiers covered down by security and stripped down to check for hot spots from shrapnel. SGT Manning checked the other two Soldiers involved while telling SSG Byers the whole time to sit down. Basically, SSG Byers was unable to comprehend what SGT Manning was trying to do but finally managed to sit down as SGT Manning conducted first aid on him and another Soldier. SGT Manning moved to the remaining three vehicles in a four vehicle convoy to see if everyone was okay; luckily only the first vehicle was struck. Soon medical personnel arrived on the scene and two Soldiers to include SSG Byers were transported to COB Speicher’s Combat Aviation Support Hospital (CASH) for treatment where all three were found with minor injuries. Because of SSG Byers’ experience while serving in Iraq, he joined VFW Post 4985 in Dalton Georgia; not only did he join but so did 12 others from his patrol; all with VFW Post 4895 in Clarksville Tennessee. 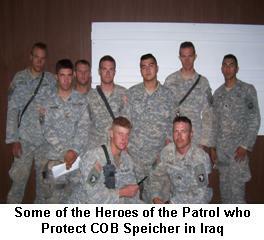 SSG Byers patrol has been such an impact on local national Iraqis in the area that when he finally did return again to patrolling; Iraqis who have become very cooperative with his patrol actually felt relieved that he and his patrol were okay. You see, not every Iraqi family is the enemy; a matter of fact most Iraqi families our victims and they pray everyday that the Americans can help their government stand up as one. It isn’t the average Iraqi family that want the U.S. to leave or for Iraq to go back the way it was before the fall of Baghdad in March 2003. Most Iraqi families are afraid for their lives and hope and pray everyday for peace. Some Iraqi families help the U.S. find insurgents but then some are too afraid to help. The Iraqi citizens are pro-American but are forced to do what they do or else. Many who have refused have lost their lives and their family’s lives. We must remain patient and hope and pray along with the average Iraqi citizen that soon one day, insurgency, fear and death will come to an end. 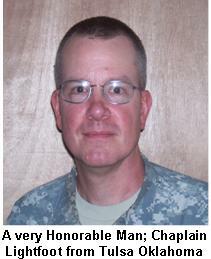 That’s what Army Chaplains are for and we are blessed to have an honorable man to serve god at COB Speicher. First Lieutenant (1LT) Glen Lightfoot is attached to the 101st Airborne Division (Air Assault) as a National Guard Officer from Tulsa Oklahoma assigned to provide God’s word to Soldiers as our Chaplain. Here is what he had to say. 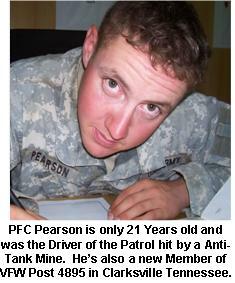 PFC Pearson is only 21 Years old and was the Driver of the Patrol hit by a Anti-Tank Mine. He’s also a new Member of VFW Post 4895 in Clarksville Tennessee. As some of you already know, average Soldiers and our heroes in Iraq today are only between 17 – 25 years young and have never experienced a war let alone being away from home before. It is veterans like yourselves, I and senior Non-commissioned Officers and Officers of are Armed Forces who instill the pride, wisdom and courage that drive their motivation and believe that each of them are there for a good cause and lastly, for us, the Veterans of Foreign Wars. Not one day since my deployment have I let these kids down; they are well aware of the enemy and how to survive; on our off time, we talk about going home and I will always bring up the VFW programs and the qualifications it takes to become a member of the most elite Veteran’s Organization in the world. In closing, as a Soldier and formal post commander for the Veterans of Foreign Wars, I want to thank each of you for the support that you have already provided many Soldiers and their families. With programs like the UNMET Needs and the VFW’s Relief Funds; Soldiers and their spouses to include dependents are getting the support that they desperately need while their significant other is overseas. Both programs help families during difficult times and find ways to help them make ends meet. Care packages and phone cards are being sent to Soldiers and BELIEVE me, they are being used everyday to call loved ones at home. Our National Commander in Chief for the VETERANS OF FOREIGN WARS; James Mueller even personally came to Baghdad to visit Soldiers and that alone was inspirational to some; this I know they will never forget. However, the most increditable program I must say has the biggest impact on our Soldiers deployed today; although all the other programs are outstanding is the “ADOPT A UNIT” program. VFW’s are provided the support for deploying Soldiers and it’s seriously noticed by them. People in airports all over the world are supporting troops by coming out and saying goodbye and good luck to Soldiers deploying. Additionally, they are there when we arrive too; for example, I am totally impressed with the welcome Soldiers receive at the Airport in Dallas Texas. Everyone from boy scouts, girl scouts, little league teams, mothers, fathers, the American legions, American Veterans, Disabled American Vets and the Veteran’s of Foreign Wars with their Ladies Auxiliary are they to greet Soldiers coming off the plane. Twice now, I have personally experience grown male and female Soldiers with tears in their eyes because of this warm welcome. This alone is the one most important and honorable things an American can do today; SUPPORT YOUR TROOPS and let them know that you SUPPORT THEM. Our Army needs so much of all that VFW brings to the table: lobbying for the Army's compelling needs (funding!) and more hands-on support, phone cards and other services are very much welcomed. I recommend that the Ladies Axillaries and family support groups continue with the care packages and the many letters that come from elementary and middle schools students all over the USA thanking Soldiers. On behalf of all the Soldiers deployed at war, the 101st Airborne Division and the Veterans of Foreign Wars, I thank you for your continued support. Once again, I am honored, overwhelmed and just in AWE that I am standing here in front of you today. I am humbled; thank you. I Hope you enjoyed my Perspective on Iraq while I was deployed with the 101st Airborne Division (Air Assault). Please feel free to use my article for future puplic awarness on Soldiers' perspectives on the War. Thanks for supporting our troops. MSG Borland & All American Commander!